Nikki and Ryan had a dream wedding at Miromar Lakes Beach and Golf Club in Miromar Lakes Florida. They got married November 9th, 2013. This destination wedding was amazing! We had done photo sessions in Disney World in Orlando and St. Augustine. This was completely different. Nikki's family had a house in the estate, down the road from the club. Her and her bridesmaids all got ready there. Both the ceremony and reception were to be held at the golf club. The reception was to directly follow the ceremony as well. So, we knew we didn't have a lot of time for portraits. We had gone to the location the day before to talk with the wedding coordinators and scope out the areas we wanted to go to for photos. We worked with the bridal car right at the club. Then we jumped in Nikki's mom's limo (she had one drive her, her husband, and Ryan's parents). She said we could take it for the photos! Perfect! Our one personal limo! Plus the bride and groom! 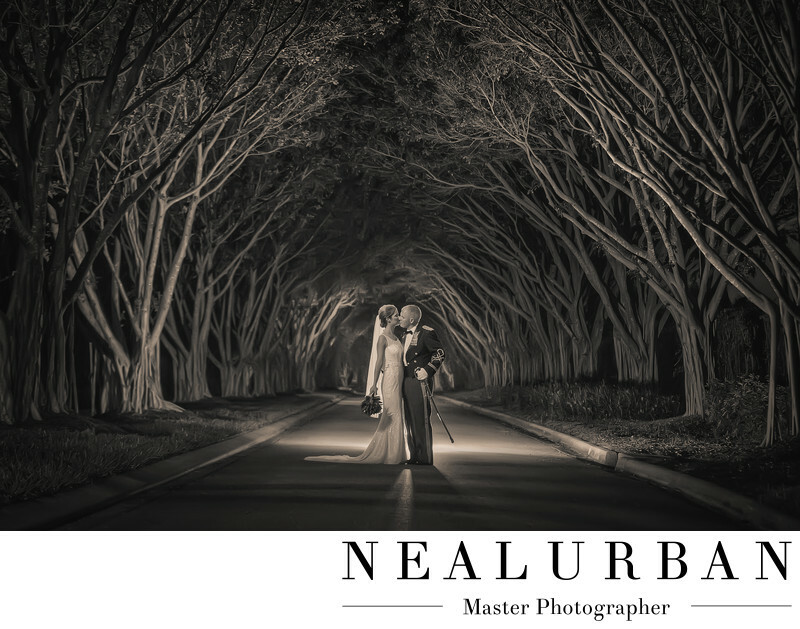 One of the main places Neal wanted to shoot besides on the beach, was this tunnel of banyan trees. We do not have these in Buffalo and we were hoping to come across some. We didn't expect this! It was getting dark fast and there was hardly any light coming through the trees. We already knew we were going to need extra lighting. We placed a light behind the newlyweds. We placed it far enough back and so it would help to light up the trees. Then we had lighting on the front of them. You can tell by Ryan's outfit, he was in the military. We really liked how his hand was on the sword and Nikki's holding her flowers. We only had about twenty minutes to do all of this. To top it all off, we got a killer sunset shot on the beach too! Even more fun, all of Ryan's groomsmen served as well. They were all wearing the same uniforms. For the bride and grooms entrance, they held up their swords for them to walk under. And it was to the theme song from the movie Top Gun! Location: 10160 Miromar Lakes Blvd. Miromar Lakes Florida 33913 United States.